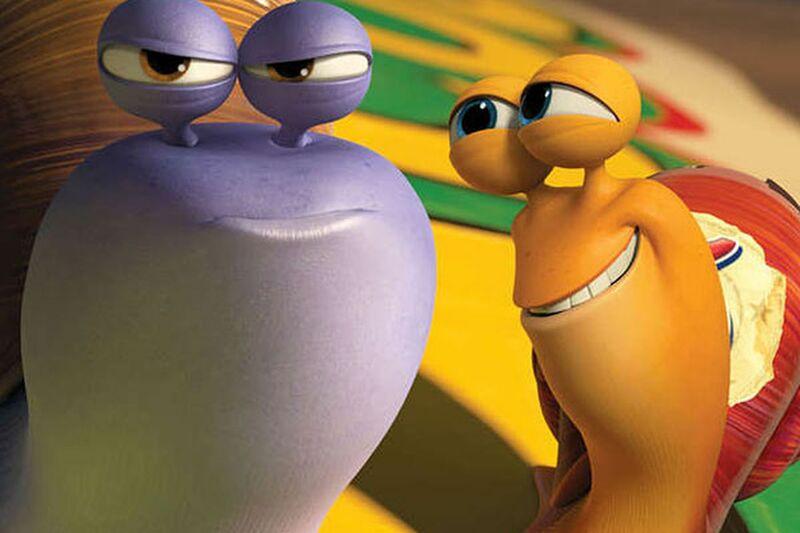 Chet (left, voiced by Paul Giamatti) is the older brother, and voice of reason, to Turbo (Ryan Reynolds), an underdog snail whose dreams kick into overdrive. Fish want to fly, birds want to swim, and snails apparently want to go fast. At least the exuberant title character (voiced by Ryan Reynolds) in Turbo does. In this hackneyed 3-D animated film, Turbo spends his days toiling with the other snails in the garden and his nights raptly watching the Speed Channel, fantasizing about being a race car driver. Or rather, because of his anatomy - a calcium chassis and lack of limbs - he dreams of being the race car. Well, what do you know? Our malcontent mollusk is the very model of the modern animated kids' movie protagonist: a young rebel who cannot abide the status quo, who demands more from this world than his fellow creatures do. Of course, in real life we'd dose a juvenile troublemaker like this to the gills. In cartoons, he's a hero. Go figure. After a mysterious experience (in other words, the filmmakers didn't go to the trouble of creating a decent context), Turbo gets his wish: the gift of speed. Eat his slime, slowpokes! The animation is vivid. And the snails, with their pastel-colored shells and bulbous eyes floating above their heads like Garfield balloons, are genial companions, though understandably afraid of crows, salt, and cruel human children on Big Wheels. The most distinctive performance belongs to Luis Guzmán in a supporting role as a taco-stand owner. Most of the film's energy and imagination is poured into two sequences: the opening scenes that establish the premise, and the climactic race when Turbo takes on his human idols at the Brickyard. But let's face it: Kids aren't a very demanding audience. If there's color, movement, and a high quotient of silliness, they're happy. Turbo does offer those elements. But not much more. In other words, they're probably already working on the sequel. Directed by David Soren. With the voices of Ryan Reynolds, Paul Giamatti, Samuel L. Jackson, Michael Peña, Maya Rudolph, Richard Jenkins, Bill Hader, and Snoop Dogg. Distributed by DreamWorks. Running time: 1 hr. 36 mins. Contact David Hiltbrand at dhiltbrand@phillynews.com; follow him at www.inquirer.com/daveondemand or on Twitter @daveondemand_TV.